A contemporary patchwork blanket for babies featuring Russian Doll motifs. Beautiful handmade knitted blanket featuring 12 individually knitted patchwork squares, incorporating Russian Doll motifs, hearts and stripes. Knitted in dusky pink, maroon, duck egg blue, cream, denim blue and taupe and backed in cream Russian Dolls fabric. All Smitten patchwork baby blankets are lightly wadded for extra comfort. This patchwork blanket has been created using Smitten’s distinctive style; combining knitted and woven textures, to provide a range of tactile experiences for little hands to explore. For a unique personalised baby gift, Smitten knitted blankets can be customised with a name, initials or date of birth (up to 7 characters). To personalise your patchwork baby blanket please select ‘personalised’ from the drop down menu and enter your required text in the box. If you would like to customise your knitted blanket with more than 7 characters, please contact us for a quote. Designed and lovingly handmade in England. All Smitten baby blankets are knitted in luxuriously soft ‘Baby Bamboo’ yarn (80% bamboo 20% wool) developed by UK based yarn spinner Sirdar, especially for babies. The wool content adds warmth to the yarn whilst the eco friendly bamboo fibres give it a sumptuously soft and gentle handle. Perfect for snuggling against babies’ skin. Wadding is 100% Polyester. Woven fabric on the reverse is 100% Cotton. 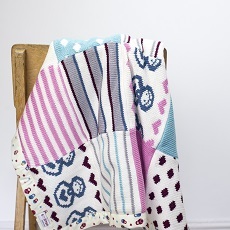 Smitten patchwork blankets are approximately 65cm width x 70cm height. Perfectly sized for use when out and about in the pram or snuggling at home in the Moses basket or cot. Machine washable on a wool cycle up to 40 degrees. Iron if necessary on the woven reverse.